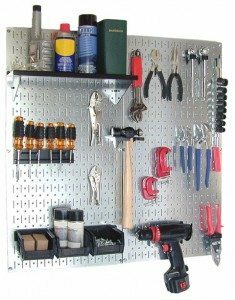 Wall Control offers an innovative twist on the old peg board design with beautiful metal garage storage wall panels that come in several colors. Here’s a well thought out design offering a complete organization system for your tools, garden supplies, paints, hobby center and more. I’ve recently installed Wall Controls tool center above my Gladiator workbench and love it! So why is it so revolutionary? The holes are all a mixture of slats and holes allowing the addition of interchangeable shelves, hooks and accessories designed to stay firmly in place. They stay put when you grab a tool……unlike the pegboard I threw in the trash. Made in the USA from 20 gauge galvanized steel and scratch resistant galvanized finish, these panels are built tough to last a lifetime. The flange is plenty deep too at 3/4″, easily accommodating various 1/4″ pegboard hardware. Make the most of your work bench by organizing your most commonly accessed tools and supplies with Wall Control storage centers. They are perfect for the garage, workshop, laundry room, and shed. There are a variety of accessories available including shelves, paper towel holder, trays, hooks and more. Some accessories can even be ordered in complementary colors. The kit shown here includes 2 metal pegboard panels which can be mounted to wall studs or to drywall using the included anchors. This Wall Control Kit is very affordable at less than $55 including free shipping. It comes with a hammer and screwdriver holder, a shelf assembly, Three plastic parts bins and 15 assorted peg hooks. The shelf and bins are available in blue, white, red, or black. The Master kit has all the accessories to keep your favorite tools close at hand on the wall. Mount this kit above your workbench for the ultimate organized system. Your friends will drool too!